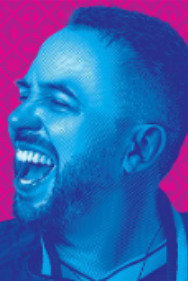 Using his trademark blend of audience interaction and razor-sharp improvisation, Abandoman (aka Rob Broderick) will take you on a magical journey, transforming the audience’s likes, loathes and daydreams into hit songs and captivating tales. Abandoman has previously won Hackney Empire New Act of the Year, Best Comedy Newcomerat the Adelaide Fringe, headlined comedy stages at Glastonbury, Latitude, Reading and Leeds, performed as the house band for Alan Carr's Happy Houron Channel 4 alongside Craig David, played the part of Dictionary Corner in 8 Out of 10 Cats Does Countdown, as well as supported and toured with pop behemoth Ed Sheeran. Get ready to throw your suggestions in the ring and watch the beautiful musical madness unfold.